The Parallel Views exhibition and its associated community engagement programme explored the relevance of the bicentenary for communities in the London Borough of Richmond upon Thames, uncovering local associations with slavery and its abolition. It also told the parallel story of twin town Richmond, Virginia, USA, to broaden understanding of the transatlantic slave trade and the impact of its demise. The exhibition examined evidence of individuals of African origin who had come to Richmond, and residents with financial links to slavery and the slave trade, and to abolitionism. A film piece by choreographer and dance historian Dr Rodreguez King-Dorset explored the use of dance within the free Black community in London during the era of abolition. A display of contemporary artwork responded to the ideas of the exhibition. 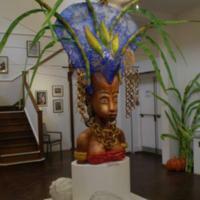 A sculpture by carnival artist Carl Gabriel linked consumers in Richmond and the conditions of production of slave-grown crops. The design was inspired by a series of workshops with local families. Artist-led workshops for children and young people led to the creation of a carnival costume piece which was included in the exhibition. 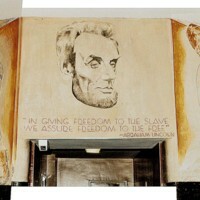 This large mural by Joshua Sarantitis, Lincoln Legacy, can be read from left to right, moving from Africa to America. 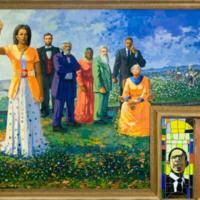 The shape of Africa adorns the backdrop until the wooden boards of the slave ship transform into the American flag. Around the young child’s neck are three medallions: Abraham Lincoln’s face, Josiah Wedgwood’s abolitionist icon “Am I Not a Man and a Brother,” and Frederick Douglass' face. Made up of over 1 million glass mosaic tiles, it is the largest Venetian glass tile mural in Philadelphia at over 10,000 square feet. 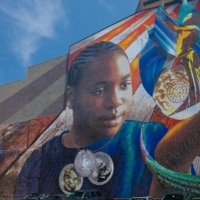 Located a block away from the Liberty Bell and Independence Mall, it is one of the few murals to be created in Philadelphia’s wealthier districts. Wilfred R. Stroud created this seven-panel mural in 1988 to be installed on the first floor of the Tubman Museum. It remains a signature piece in the Museum’s collection today. When the mural was being created, Stroud expained: “The purpose of this mural is to present a visual history of the black man and woman from the earliest times in Africa to the present times in America. The panels focus attention upon the impact of outstanding persons, and events that made a change in the lives and conditions of black people in particular, and the world in general.” Stroud dedicated an entire panel to the topic of slavery. 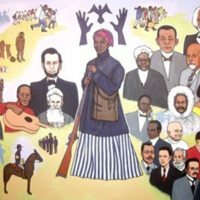 Harriet Tubman stands in the centre, holding a rifle and surrounded by other antislavery leaders: Sojourner Truth, Abraham Lincoln, Frederick Douglass and John Brown. E Pluribus Unum, “Out of Many, One,” was a mural created by Lewis Lavoie in 2012. Described as a snapshot of America, the mural brings together 50 different stories from American history, celebrating a diverse past. 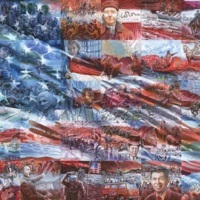 Located in South Jordan City’s central City Hall building, the mural is a collage of narratives such as ‘The Abolitionist Movement,’ ‘the Civil War,’ ‘The Creation of the New Media’ and ‘Westward Expansion’ for example. Painted in 2012 by MTC Studio, the mural depicts the black abolitionist Frederick Douglass shaking hands with President Abraham Lincoln. 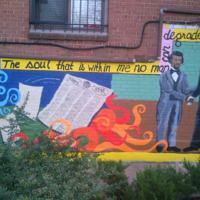 An older version of Douglass is offset to the right side of the mural. The mural site is adjacent to the Frederick Douglass National Historic Site in Anacostia, Washington D.C. In 1959 the Hungarian-American illustrator and muralist Hugo Gellert created the series Seward Park Housing Murals. The four-panel mural series depicts Thomas Jefferson, Abraham Lincoln, Franklin D. Roosevelt and Albert Einstein and was commissioned by the International Ladies Garment Workers Union. 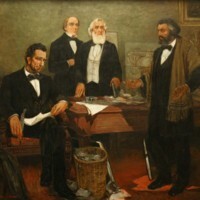 The Abraham Lincoln panel has an abolitionist section that features Frederick Douglass, John Brown, Harriet Tubman, Sojourner Truth and William Lloyd Garrison.The mural was threatened with destruction many times, including in 1996 when the building residents voted to become a private co-op. Individuals on the co-op board then voted to rid the lobby of the murals that they deemed racist, ugly, socialist or 'past their time.' But the building manager, Frank Durant, insisted on their preservation. Ethiopian artist Mekbib Gebertsadik put the abolitionist Frederick Douglass alongside President Lincoln, the abolitionist John Brown, Malcolm X, President Obama and Michelle Obama. Titling the mural From Menelik I to Obama, Gebertsadik also placeed Douglass on a timeline of diasporic history that starts with Menelik I, the first Solomonic Emperor of Ethiopia in 950 BC, to President Barack Obama, the first African American president. The mural is a few blocks away from the White House at the Gospel Rescue Ministries homeless shelter, acting as a symbol of hope for those passing through. “Primarily, the clients we serve are African American and [the mural is] an inspiration to our clients of being able to dream” explains Earl Murray, Associate Director for Development and Marketing for Gospel Rescue Ministries.